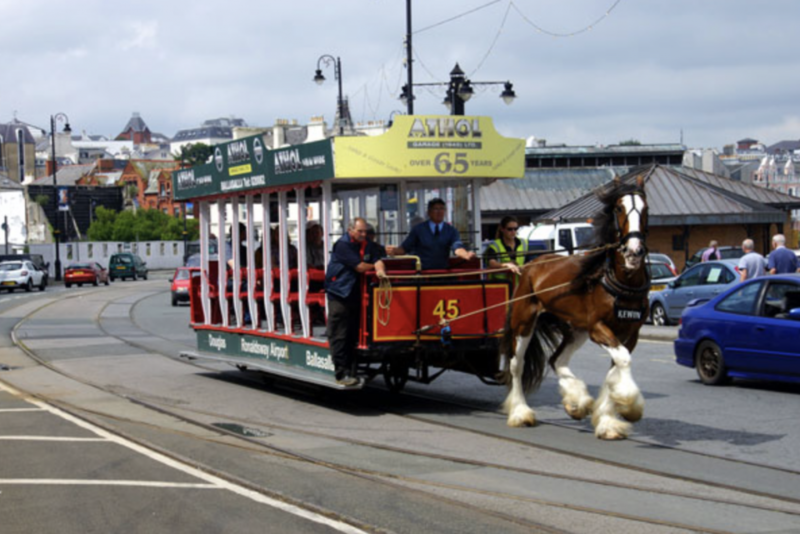 If, like me, you went to the recent BIBBA conference on the Isle of Man you must also have noticed the horse drawn trams but did you know they too are threatened with extinction? Personally I was charmed and delighted by these lovely Clydesdales trotting along the promenade on hairy great feet with their ears all pricked and eager. In fact I was so charmed and delighted by them I looked them up on the Blithering Internet when I got home and was incredulous to discover that the Powers-That-Be in Douglas are planning to scrap them! Click the photo above for a close up, look at that lovely, lovely horse and ask yourself how on earth can that be? After 140 years of service up and down the 1.5 mile long Douglas promenade linking the two antique railways, one steam and one electric, which terminate at opposite ends of the bay – six ‘surplus’ tram cars have been auctioned for a total of £10,000 and the purpose built stables have been sold for ‘development’. Exclamation mark! I don’t know about you but I’d travel a long way to see working horses but I can see ‘Development’ anywhere and everywhere. Don’t tell me it’s progress lads. Progress is when change leads to improvement or betterment otherwise it’s just change for the sake of it and that is stupid. For a small island in the middle of the Irish sea, relying strongly on the tourist trade I’d say this is just the type of thing to cherish and promote. Because it’s unique and it’s different and because the Isle of Man doesn’t get enough sunshine to compete with Capri or Maderira etc and lovely as it is, the scenery does not compare to the dramatic beauty of the Hebrides, the Aran Islands or even the Isle of Arran. My sharp-as-she-ever-was 83 year old mother put it in a nutshell for me when I was talking to her this morning on the phone and said I had been to the Isle of Man. Before I could say anything else she said, “Have they still got those horse drawn trams?” She has been to the Isle of Man but so long ago she can’t remember when she went, how she got there, who she went with or what they did when they got there. In fact she can’t remember anything else at all about it except the horses. So at the next Council meeting in Douglas – when the horses come up for execution again – remember that or the day may come when nobody remembers the Isle of Man at all! I should add that there has been stay of execution and the horse trams are to continue for another two years – that’s to 2018 but what happens then is blowing in the wind.